Since we started our business we have met many women who have been affected by cancer. They have told us their stories, their problems and sometimes their worries. They have also encouraged us in our venture. The aim of Comptoir de Vie is to help women to see their bodies in a different light. We are trying to make their lives easier while they are ill with our huge range of scarves, turbans, wigs and specialized wellbeing products. Last October “Pink for October”, breast cancer awareness month, we decided to put our commitment to women affected by breast cancer into action. We decided to make a gift to directly benefit women touched by cancer, so we gave away 400 chemotherapy scarves to breast cancer patients. 400 scarves for women who often feel bereft and traumatized by the loss of their hair. 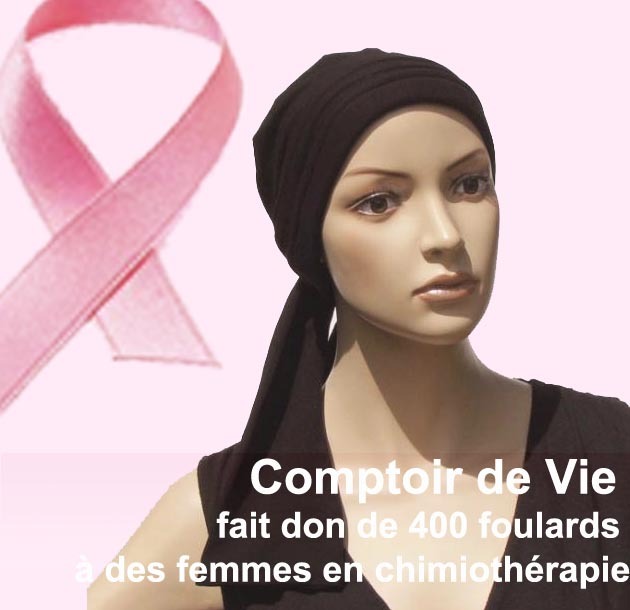 Some of the scarves were given to breast cancer patients in the Hôpital Timone and Hôpital Nord in Marseilles and in early November to patients in Institut Gustave Roussy. We also gave away another batch to Association Ressources in Aix-en-Provence. We hope that these scarves will bring some comfort to people in suffering. You can make a contribution, help us! Thank you in advance for your support in this charitable work by spreading news of our work. Keep telling your friends about Turban.net and our charitable work by passing on our details to those around you.